It’s the Easter long weekend, so what better way to kick off Good Friday than by shopping online? AUKEY has a couple sales in time for Easter you may want to check out, to spice up your gifts from the Easter bunny to friends and family. 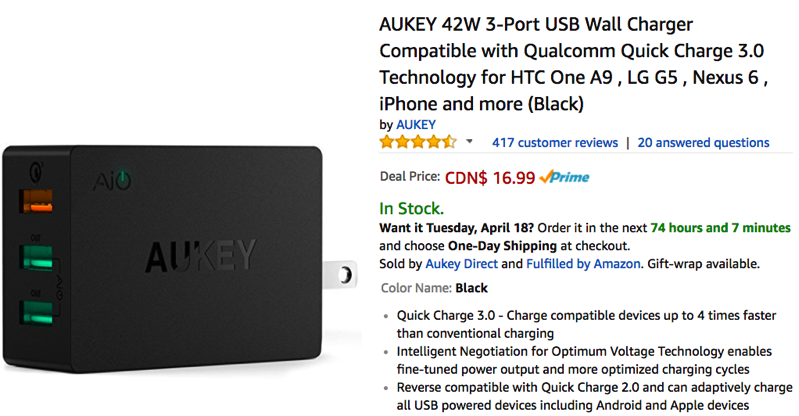 For today only, the AUKEY 42W 3-Port USB Wall Charger with Qualcomm QC 3.0 Technology is available for 40% off at $16.99 on Amazon.ca, its lowest price ever according to price tracker CamelCamelCamel. This tiny wall charger is smaller than a credit card and will charge your iPhone, iPad or other USB devices at up to 2.4A per USB port. It comes with a 24 month warranty and has built-in safeguards to protect your devices from overcharging, excessive current and overheating. Click here to jump on the AUKEY 3-Port USB Wall Charger before the sale ends today. The other deal available is the AUKEY 20000mAh Power Bank, which should come in handy if you’re still playing Pokemon GO and need extra juice for your iPhone or iPad on the go (or any other USB device). It’s on sale for 40% off at $25.99 on Amazon.ca, its lowest price ever on the site according to price tracker CamelCamelCamel. This high-capacity Power Bank can fully charge your iPhone 7 6.5 times or 9.7-inch iPad Pro 1.5 times. Despite Apple devices not supporting Quick Charge 2.0 technology, this power back will still charge your devices without a hitch. With summer around the corner (hopefully) and road trips and camping galore upcoming, this power bank will ensure your devices stay juiced up so your kids don’t freak out at you. Click here to buy the AUKEY 20000mAh Power Bank—the sale price expires on April 17th.